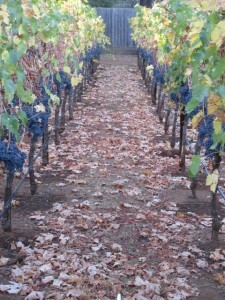 We harvested our vineyard October 28. Harvesting the last week in October is normal for us although this was not a normal year. Our total yield was 25% less than last year. The unusual weather, especially the June hail storm during pollination, affected us more than we realized. 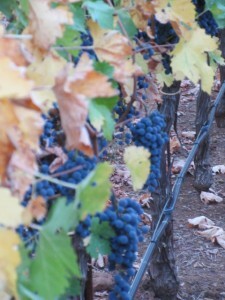 Our vineyard manager observed that our clusters were loose this year, which means the clusters had fewer grapes. We are very grateful for our harvest. Some of our fellow farmers are unable to use their grapes because of smoke taint. Howell Mountain had much less smoke than the lower elevations in Napa Valley. Bob Bolan, the winemaker, says the fruit is ready. It looks and tastes great. Gerry has climbed aboard his tractor and he’s ready to go. 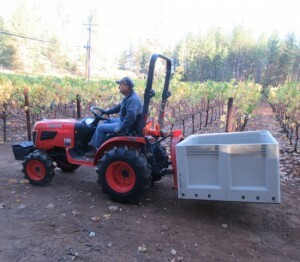 On the back of the tractor is a bin that holds about 800 pounds of grapes. 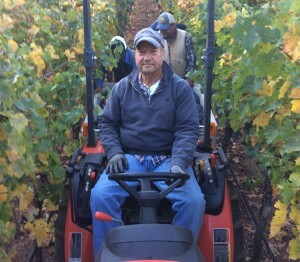 He drives the tractor through the rows allowing the vineyard workers to dump their picking bins when they’re full. This process makes it easier on the crew because they don’t have to carry full bins very far. Each cluster is hand cut whole. Notice the picking bin being dumped on the top-left side of the photo. The crew harvested 6 rows simultaneously, 3 on each side of the tractor. They pass the picking bins to the tractor to be dumped. 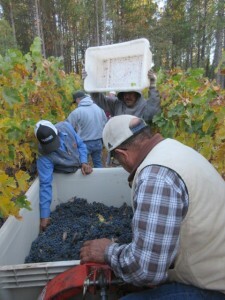 A crew of 12 harvested the vineyard in about 4.5 hours. They’re skilled, fast, and amazing to watch. 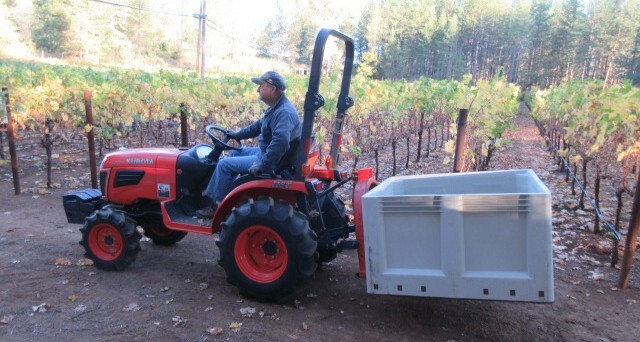 Gerry drives the full bins to the road on the edge of the vineyard. 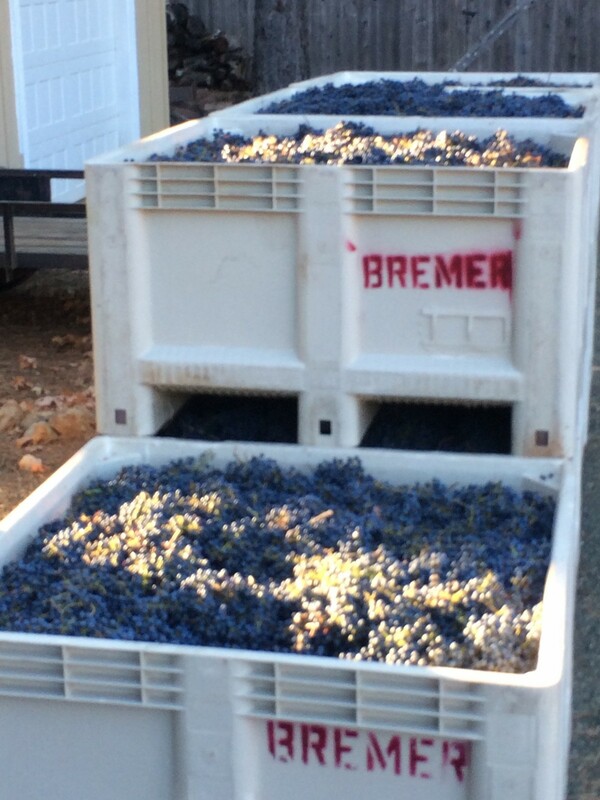 There the forklift operator stacks them until they are loaded onto a truck that hauls them to the winery. 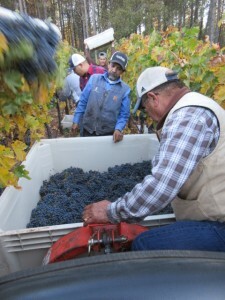 Thank you to our vineyard manager, the Gallegos family, and all of their crew members for all the work they did this year to help us produce another wonderful crop. 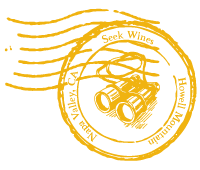 We are especially thankful for the many blessings we received this year and mindful of so many others who weren’t as fortunate.